Boise, ID percussionist and educator Pat Flaherty came to visit us today. Pat is a longtime friend and supporter of Grover Pro. 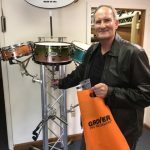 He picked up a set of Grover Performance Snares for a special Gene Krupa model Radio King snare drum he is restoring. Pat maintains a robust teaching studio in Boise, serving over 50 students! If you are in the Boise area and looking for a top tier teacher contact Pat. If you’re lucky he’ll fit you in!